Stevie J leads the Cats prices and he’s also the most expensive player in the whole competition, Jimmy Bartel is a DEF/MID and Hamish McIntosh offers some ruck value. 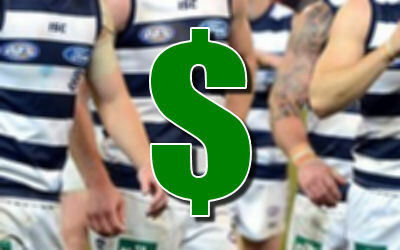 The most expensive AFL Fantasy player in 2014 is Steve Johnson ($641,600). Unfortunately he’s lost DPP so he’s just a MID this year. Jimmy Bartel ($514,900) is named up as a DEF/MID this year. Keep an eye on ruckman Hamish McIntosh ($344, 700) who has managed to get a 30% discount on his 2012 average.